Merseyrail have ordered 52 new Stadler trains to replace, the 59 geriatric Class 507 and Class 508 trains on the Northern and Wirral Lines. In some ways I was surprised, as with the possible takeover of tye Borderlands Line to Wrexham in Wales, I thought that Bombardier, may have had a good chance with Aventras with an onboard energy storage or IPEMU-capability. These are some useful articles that give more details. These are my thoughts on the new trains. The Wirral Line trains run in a single-track circular loop tunnel under Liverpool (The Loop), which is a fairly unusual railway formation. But it works well and means that the three stations on The Loop can be single-platform. The track in the Loop is being relaid in the first half of 2017 and this article on the Merseyrail web site describes the work. This is a video of the rebuilding. The tunnel has a diameter of 4.7 metres. By comparison, the Crossrail tunnels have a diameter of 6.2 metres. If you are relaying the track, you will make sure, that the track and platforms fit your current trains, which could run for another five years or more. The tunnels and platforms will probably be sized, so that there is only a small gap between the train and platform. The slab track chosen looks to be of the highest quality and similar to that which Transport for London are using on the Sub Surface lines, as described in this article in Rail Engineer. So Liverpool is getting a world-class railway track on The Loop, which will fit its current rolling stock, like a glove. It will also be very safe, as the gap between the trains and the platform could be very narrow. They don’t say in the video, but will the tracks be arranged so that the trains align for step-across at the stations on The Loop? If you have just rebuilt the track in the Loop, then this will have implications for the new trains needed for the lines. The small size of the tunnel and the precision fit, mean that any new trains must be a similar height and width, as the current Class 507/508 trains. The height of the Class 508 train is 3.58 metres and for comparison the height of a Class 378 train is 3.78 metres. I don’t have a figure for a Bombardier Aventra, but I suspect that they are just too fat. So it looks like that a small number of non-standard size trains need to be built to fit the slightly smaller size tunnels under Liverpool. The Railway Gazette article says this about the trains ordered from Stadler. There will be a mix of airline and facing seats, with more space for bicycles, pushchairs and persons with reduced mobility. 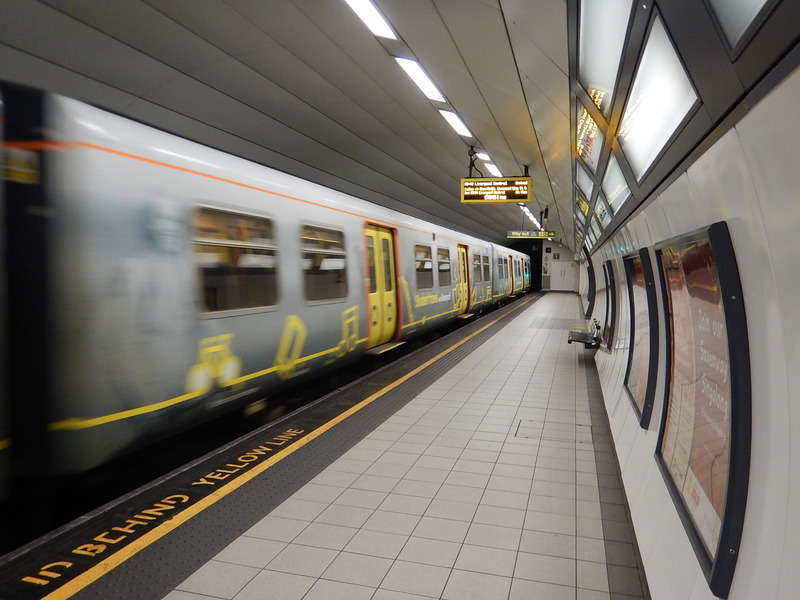 The train body will be designed specifically for the Merseyrail network, with lower floors and a sliding step to provide near-level access. It is interesting to note, that Stadler also won the order for the smaller trains on the Glasgow Subway, which I wrote about in Glasgow Subway Orders New Trains From Stadler. As it looks like they will be specially built to fit the tunnels and the platforms, this has various implications. Passengers in wheelchairs, pushing buggies or dragging large suitcases should be able to just wheel themselves into the train, which is described as lower floor. All platforms, that the trains call at, must have the same critical dimensions. Safety could be increased as the gap between train and platform could be very narrow. Incidentally, the trains are reported to be fitted with automatic gap fillers, to make sure nothing drops through the gap. Will the tracks in the Northern Line tunnel through Liverpool be renewed? The trains had better be well-built as they’re going to have to last a long time. But if say extra trains were to be needed to increase frequency, capacity or routes, Merseyrail would probably just send an e-mail to Switzerland. Most new trains need modifications to platforms, to match the trains. As it appears that the new trains are designed to fit the current platforms, I suspect that very little will need to be done before they arrive. On my travels, I did notice on-going work at some stations, but this would fit either fleet of trains. From the specification of the trains, it would appear that all of the driver-only-operation equipment is on the trains, rather than the platform, so station improvement money can be spent on passenger facilities like lifts and weather protection. Any new stations that may be required could possibly be built to an affordable but very passenger-focused design. Special trains don’t come cheap and these 52 trains roll in at a total of £450million or about nine millions a train. Compare this with the price of £260million, that Transport for London paid for 45 similar-capacity Class 710 trains for the London Overground, which works out at just under six million a train. The trains are apparently not leased, but paid for directly. The Rail News article, says this. The 52 four-car trains will be publicly owned rather than leased from a ROSCo, and the finance needed will be raised in various ways, including by using a rail reserve that has already been established for this purpose, plus loans at ‘favourable interest rates’. Merseytravel said ‘such opportunities are currently being explored, such as a loan from the European Investment Bank’. London financed the first London Overground trains in a similar way. The Railway Gazette article, says this on capacity. The 65 m long four-car EMUs will have the same number of seats as the existing three-car sets, but will be 4 m longer with wide through gangways to provide an increase in standing space. This will increase total capacity per EMU from 303 to 486 passengers. It looks like each train is 64 metres long, with a car length of 16 metres, as opposed to 60 and 20 for the current trains. I suspect that there is some interesting behavioural software out there, that is used to design people systems. So the interiors will work! Will it be a lot more packed in there? I don’t know, but the space between carriages is now available for passengers. The same trains will be able to run on both the Northern and Wirral Lines. Will the extra capacity in a single train, mean that most services will be run by a single four-car unit? In the Peak, I suspect two trains could be coupled together, as they are now. However, they will couple together and uncouple much quicker and probably automatically. On the other hand the trains themselves could increase capacity. I’ll look at the Northern Line first. In London, Thameslink, Crossrail and the East London Line, run similar services to those on Liverpool’s Northern Line, where services fan out from a central core. I believe that if the Northern Line ran twelve trains per hour (tph) between Sandhills and Hunts Cross stations, that this would increase the capacity on that route. Twelve tph running all day, would need just 24 trains. If in the Peak more trains were needed, extra services would be added to an appropriate route. The Wirral Line is unique, in that trains from four destinations slot together to go under the Mersey, go round The Loop, before going back to Birkenhead and fanning out to where they started. Currently, twelve tph run in The Loop and I suspect to provide this service all day needs just 24 trains. Merseyrail have ordered 52 trains, which means there are just four trains to cover maintenance issues and increase services in the Peak. All new and upgraded lines seem to suffer from London Overground Syndrome, where passengers see what they like and the original passenger forecasts prove to have been pessimistic. On the East London Line, three-car trains were forecast to be the right size, but they had been designed to be lengthened and now after two upgrades, the trains are now five-cars long. As this syndrome has been seen on the Borders Railway, the Nottingham Express Transit and other places, I would not be surprised to see it on Merseyrail’s Northern and Wirral Lines. But the design of the trains, future-proofs the lines, should there need to be more capacity. Provided, the signalling can accept the increased frequencies, more identical trains would be added to the fleet. Or trains could be lengthened, by adding another car, so that the busiest routes perhaps ran five-car trains. As it would only be a problem of success, I suspect, that the financing wouldn’t be a problem. The Railway Gazette article, says this on extra items included in the contract. This headline figure also covers upgrades to the power supply, platforms and track, as well as refurbishment of the depots at Kirkdale and Birkenhead North and future maintenance of the new trains. I’ve heard that Merseyrail’s power supply is a bit dodgy and probably needs updating. I’ve always wondered, if the trains would handle regenerative braking by the use of onboard energy storage. Nothing is said except this in the Railway Gazette article. At 99 tonnes, the EMUs will be lighter than the current 105 tonne trains, and energy consumption is expected to be 20% lower, including regenerative braking; options for energy storage are to be studied. It will be interesting to see the specification of the new train. The Railway Gazette article, says this on performance. A new timetable will be introduced in 2021 once the existing Class 507 and 508 units dating from the 1970s have been withdrawn; the new trains’ better acceleration and braking is expected to enable Hunt’s Cross – Southport journey times to be reduced by 9 min. The interesting thing, is that being nine minutes quicker between Southport and Hunts Cross, will bring the journey under the hour and mean that the service can be achieved using less trains. It would also mean that all trains could go through the core to Hunts Cross, without having to turn trains at Liverpool Central. The trains will be fitted with regenerative braking, where the traction motors, act as generators to slow the train, turning the train’s energy into electricity. There are three common ways of handling the electricity generated. Feed it back into the power network for other trains to use, as is done on the London Underground and on the extensive third-rail network in the South East. Store the energy on the train and reuse it, as has been demonstrated by Bombardier and is common in vehicles as diverse as high-performance cars, hybrid buses and trams in Seville. Feed the electricity into resistors on the roof of the train and turn it into heat. I believe that option 3 is totally unacceptable and is akin to burning money. Option 1 will probably require extensive modification to the power supply of the Merseyrail network, as the supply is not known to be of the best and there is no need to handle regenerative braking with the current Class 507/508 trains. So will we see some form of energy storage on the trains? Birmingham’s trams will have on board energy storage in a few years, so the technology is on its way. The Railway Gazette article, says that options for energy storage are to be studied. As an Electrical and Control Engineer, I strongly believe that the cost cost-effective way to handle the regenerative braking energy is to store the energy on the trains. On European gauge trains, equipment is often mounted on the roof, where there is plenty of space in the generous loading gauge. But Merseyrail has the problem of the small tunnels. Look at this picture of a Class 507/508 train entering a tunnel at James Street station. Note how there is some space above the train in the tunnel entrance. Imagine a train specifically-designed for these tracks, platforms and tunnels, with the bottom of the doors level with the platforms. Would this release more space for putting energy storage on the roof, as has been done with Seville’s trams? If I am right with this speculation, onboard energy storage also enables the following. Regenerative braking on the whole of the Merseyrail third-rail network. Next station recovery of the trains, in case of power failure. The ability to extend routes using stored energy. In addition, trains with onboard energy storage have other maintenance and operational advantages. The Railway Gazette article, says this on more destinations. The 750 V DC third-rail EMUs will be capable of conversion to dual-voltage operation for use on 25 kV 50 Hz lines with a view to serving Skelmersdale, Warrington and Wrexham in the longer term. If onboard energy storage is fitted with sufficient range, this would open up other possibilities and also make destinations like Preston much more affordable to implement. Note that I said train-tram and not tram-train. In Riding The Vogtlandbahn, I talked about riding a unique German railway in Zwickau, where the trains go walkabout from the main line station and travel through the city just like trams to a stop in the centre. This picture shows a train-tram at that stop. You don’t need to guess, who made the train! It was of course Stadler and is not electric, but a diesel-multiple unit. It is worth comparing weight and capacity of Liverpool’s new trains with Manchester’s trams. The Railway Gazette article, says that the trains will weigh 99 tonnes and have a capacity of 486 passengers. This compares with the M5000 on the Manchester Metrolink, which weighs in at 80 tonnes for a double unit and carries 400 passengers. So weight and capacity is not out of line with a typical large tram. 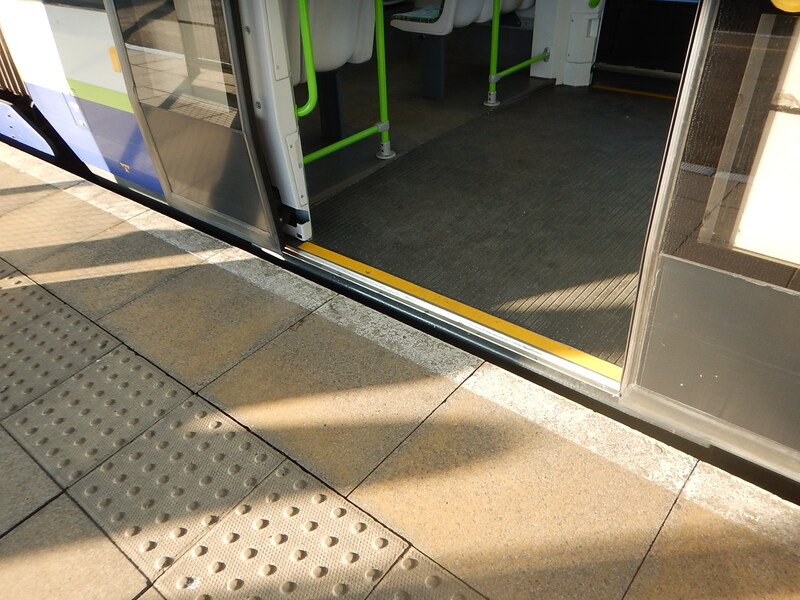 Trams need to have a door sill height, that gives level access between the tram and platform. Not all trams and trains match the platform, as well as this example on the London Tramlink. But, Liverpool’s new trains will be built to fit the current track and platforms, which after updating, will all be to the same height and designed to give step-free access.. 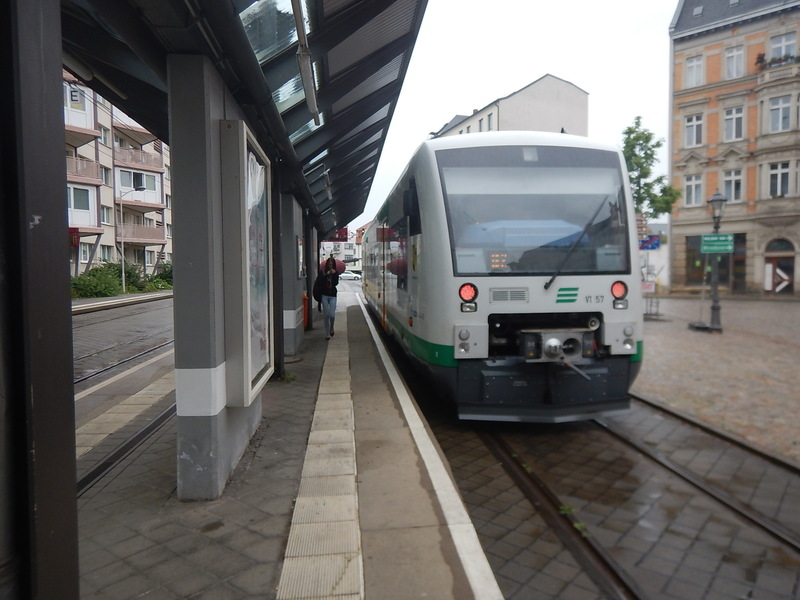 Without doubt, the new trains could call at correctly-dimensioned tram-style stops, just as the train-trams do in Zwickau. Tram-style sections of the route could be designed to the following principles. Tram-style flush slab track, so passengers can just walk across the track. Trains would run using onboard energy storage. Rail-style signalling, whether trackside or in-cab. Charging station, like a Railbaar if required. Lines could be single-tracked with single-platform stops to make everything more affordable. Could we see Merseyrail’s new trains leaving the rail lines at Liverpool South Parkway station, switch to onboard energy storage and continue to the Airport on a dedicated track without electrification? This Google Map shows the station and the Airport. The station is at the top of the map in a triangle of lines. There must be various possibilities for a route between the station and the airport. The train could call at the New Mersey Shopping Park. From my knowledge of both areas, the Liverpool Airport route is no more difficult, than what was done in Zwickau. Journey times to and from Liverpool Airport would be something like. If they followed Northern Line principles, the frequency would be four tph. I may be wrong, but it looks like Merseyrail have acquired trains, that running as train-trams can fulfil the link to Liverpool Airport. The proposed Liverpool Airport link is a classic route extension using onboard energy storage, which is very similar to the extension of the Midland Metro through Birmingham City Centre. So could any of the routes to current terminals, be extended using onboard energy storage and running as a tram. Ellesmere Port, New Brighton, Southport and West Kirby stations all serve coastal towns, but despite this, they don’t seem the sort of places that cry out for a tram along the promenade. Chester could possibly benefit, but I suspect this could be one very much for the future. 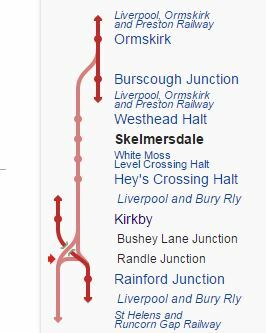 Skelmersdale could be a distinct possibility, as the scars of the rail routes to the old Skelmersdale station, from the two Northern Line termini of Ormskirk and Kirkby, which are still visible on Google maps. This map from Wikipedia shows the old Skelmersdale Branch. A new railway could be built simply, as it was in Zwickau. The train could even go walkabout in Skelmersdale to serve important places. As Kirkby station needs demolition and rebuilding, unless it gets Listed status, as a monument to the British Rail School Of Crap Design, there must be opportunities to give Kirkby and Skelmersdale a modern transport system to be envied. If you think all of this speculation is outrageous fantasy, I suggest you visit Zwickau and ride the Vogtlandbahn. A lot of people, that I’ve met from Liverpool, mourn the passing of the Liverpool Overhead Railway or the Docker’s Umbrella. Because of this, it has been suggested that a tram should run along the Mersey, past the main attractions of the Waterfront, connecting to the Northern Line at perhaps Sandhills and Brunswick stations. This is one of those projects thast gets speculated about for years and then it gets implemented because it is integral to another project, like a massive development or a City getting the Olympic Games. Or in Liverpool’s case the Commonwealth Games, which is a distinct possibility in either 2022 or 2026! As it runs through a World Heritage Site, it will have to be built without overhead wires and run on stored energy. The Canada Dock Branch runs in an arc to the North and East of Liverpool city centre. It is a freight route linking Liverpool Docks to routes out of the city. The capacity of the route is being upgraded to 48 freight trains per day. There are no passenger services. The line runs close to both Liverpool’s main football grounds. Are there any large developments, that would benefit from a train service along the route of the line? With the development of the massive new dock at Liverpool2 and the pressure for more electrified freight trains, I think it is likely that the Canada Dock Branch will be electrified. So could passenger services be reinstated on the line? 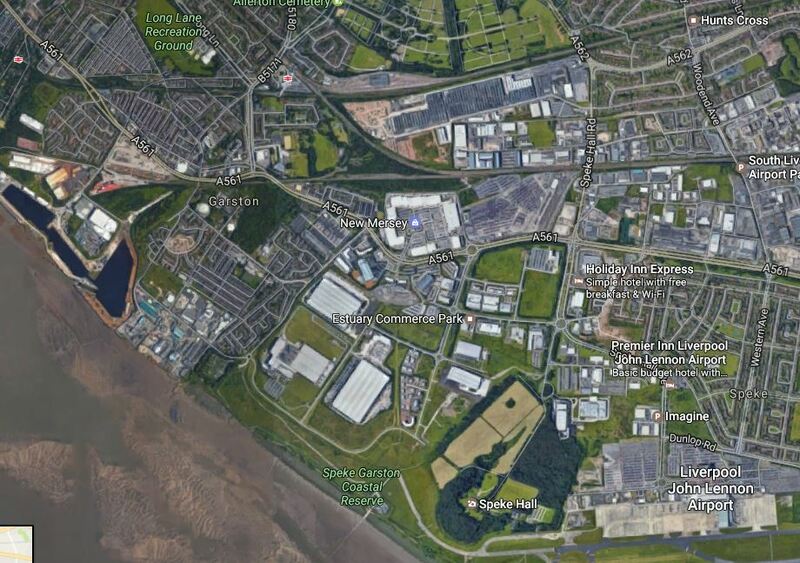 This Google Map shows the section of the Canada Dock Branch, where it curves round the two football grounds. The station at the bottom left is Sandhills station, with Merseyrail’s Kirkdale depot to the North. I don’t know whether there is a connection, but the lines cross in the region of the depot and if required one could probably be built. I think it is likely, that if the Canada Dock Branch is electrified for freight reasons, then Merseyrail will look at running a service along the line. It might terminate at Sandhills in the North. It might terminate at Broad Green, Edge Hill or even Lime Street in the South. Stations could be simple affairs, much like the one in the picture at Zwickau. Whether they did propose a service would depend on traffic forecasts and possible costs. Liverpool do spectaculars well and if they get the Commonwealth Games in either 2022 or 2026, I can see that the city could use the new Stadler trains to create a line for the Games, thaqt would be a legacy, that the city needs and wants. Starting in the South by the Albert Dock and the Echo Arena, the line would go past the Three Graces at the Pierhead and then North to Everton’s new stadium at Bramley-Moore Dock, which is being proposed as the main venue of the Games. 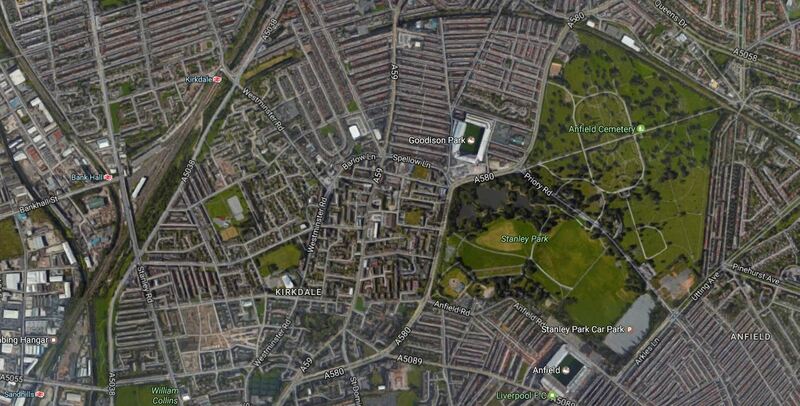 From there it could continue to Liverpool’s Anfield Stadium, which will probably play some part in the Games. The line would also connect or go close to the following. The Wirral Line at James Street station. The Northern Line at the new Vauxhall station. The museums and galleries at the Albert Dock. I’m sure Liverpudlians will give it a suitable nickname. Much of the Southern part of the route is within the Liverpool Maritime Mercantile City World Heritage Site. I think it would be possible to run the route using onboard storage. Charging would be at each end of the route. Catenary running could be used between the two football grounds, some of which could be on an electrified Cansada Dock Branch. The Southern end could use on-street running with catenary to go up the hill to Hope Street , to serve both cathedrals. After the Games, both Liverpool football grounds would have a tram connection to the Pierhead. Designed properly, it could become one of the world’s most iconic tram lines. Merseyside will be getting one of the best commuter railways in the world! I also think, that these innovative trains will make other cities and train operators, think hard about the design of their railways and the trains.